As a property manager or developer, you want reliable, high quality service while controlling your cost. Your properties speak volume around how you manage your accounts and care for your tenants. A well-designed landscape and properly maintained property will not only mitigate unnecessary future cost, but appeal to your prospects, current tenants and their patrons. Dependable Services Inc. has extensive experience providing commercial landscaping and maintenance in St. Louis, MO and surrounding areas. Our company takes pride in a long history of serving commercial developers, general contractors, property management companies and commercial property owners. Today, we are entrusted to maintain the grounds of many of St. Louis and surrounding areas high-visibility commercial properties. New commercial landscape installations and maintenance continue to account for a substantial part of our business. Our commercial landscaping crews have achieved a high standard of excellence in the industry. Their skills and experience in bed preparation, plant identification and installation, irrigation, lighting and hardscape construction are a source of great pride for them and us. We believe you will feel that way, too. We are fully insured for Workers Compensation and liability as a commercial landscape contractor. We work with fellow contractors and project superintendents during all planning stages. Our goal is to minimize future maintenance costs and eliminate the unnecessary exposure of redoing work that should have initially been completed correctly. 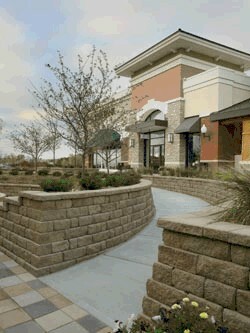 Tell us about your commercial landscaping project and get a free estimate and consultation. A landscaping professional from Dependable Services will meet with you personally to identify the unique features and specific challenges of your project and provide a free estimate for our services.